Congratulations to all of the winners of the AIA Central Pennsylvania 2014 Design Awards! We would like to thank the jury from the Blue Ridge Chapter of Virginia for their time reviewing the submissions and to all firms that submitted projects. Start thinking about the projects you want to submit next year! A call for entries will be sent in spring in 2015! Thank you again to all of our sponsors and participants and congratulations to the winners! When the owner of Mexitaly learned that PennDOT was taking his restaurant by eminent domain to make improvements to an interchange along Interstate 83, he engaged the architect to design renovations to a suite at a nearby strip mall. At 3 times the size of the existing restaurant, architect’s design looks to salvage the worthwhile existing components and lose much of the pre-existing visual clutter. A new bar area largely defined with walnut cladding is the springboard to changes that make the space “warmer” and more inviting while affording patrons a number of seating options. Commissioned artwork provides pops of color to the space as a nod to the bold colors used at the original Mexitaly location. The design is purposefully flexible to accommodate how service might evolve at the new location, and the process was driven by a tight budget and schedule working around the fabrication and installation of a new brew house component and PennDOT’s schedule. Planned as a retreat home for a single father and his twin sons, the river house along the west shore of the Susquehanna serves as a place of escape and reconnection. 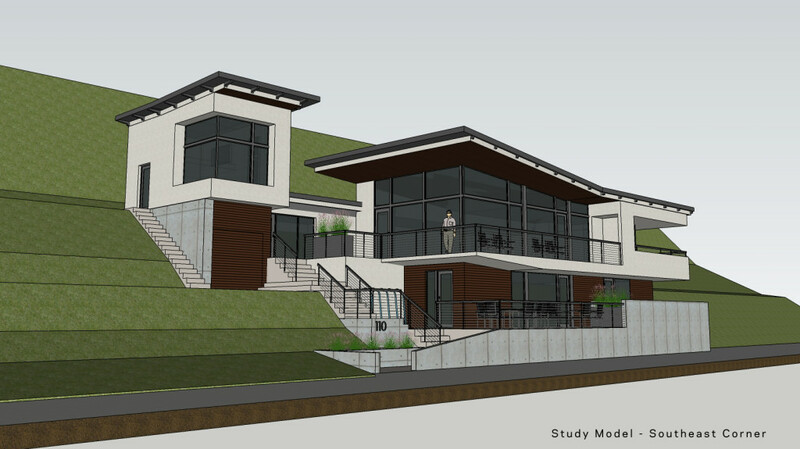 Planned for construction in late 2014, the proposed home will be built upon the foundations of an existing cottage. The highly constrained property is situated within a FEMA floodplain requiring the new construction to remain within the footprint of the existing and pinched between the river’s edge and a steeply sloped hillside. By using a simple materials palette of white cement, stucco, redwood and glass, the composition remains unified while providing opportunities for subtle metamorphosis during the changing seasons and qualities of daylight. As the white stucco and glass absorb and diffuse reflected sunlight from the water’s surface, the home’s exterior and internal environment change as well. The project began as the renovation of a high school and elementary school within an existing three school campus. Early discussions stressed the importance of redeveloping the entire campus and not only the two buildings to create a unified campus. Although they were in close proximity to each other, all three buildings faced away from each other. The final design reorganized the entire campus stressing connections between the three buildings and separation of traffic. A series of plazas, play areas and student lawns were developed at the core of the campus connected by walkways between the buildings. The public exterior and interior space were pulled into Middleburg Elementary School through a profession of scales. The plazas conclude with the entrances to the buildings. These entrances transfer into public streets within the buildings leading to the community spaces within the buildings, gymnasiums, cafeterias, libraries and other public spaces. At the completion of the study, the commissioners decided they were committed to maintaining the buildings as a functioning courthouse and office building for the future of the county. This option included modernizing the building with new systems that were hidden and minimized impact upon the historical character, restoring the historical character, and repairing structural damage. At the end of the project, the county and commissioners’ two goals were met. First, was to restore a symbol of pride for the community to its original grandeur. Second, was to modernize the facility so that it can be a living breathing facility serving the people of Jefferson County for years into the future. The branding “tagline” utilized by the John & Katherine Zimmerman Center for Heritage is “Connecting People to the River and its History”. As part of a comprehensive facility improvement project involving both their waterfront site along the Susquehanna River and historic eighteenth century headquarters building, the Susquehanna Gateway Heritage Area commissioned the architectural design for the construction of a Waterfront Pavilion and Accessibility Enhancements connecting all public recreation and heritage interpretation facilities on their property – and making them truly accessible to all users/visitors. Such “public access” projects rarely get the design attention and careful consideration they deserve (i.e. many are not even designed by Architects). The Architect selected for the Zimmerman Center project was determined to design a series of enhancements that not only accomplished the specific accessibility objectives – but did so with a thoughtfully crafted design based in dignity, sensitivity and elegance. A primary component of the multi-phased enhancement project was the design and construction of a small pavilion at the water’s edge – a new “place” accessible to everyone- where gathering and heritage/environmental interpretation could occur. The 320 North George Street project involves the adaptive reuse of a 47,000 sf turn-of-the-century warehouse in downtown York, PA. The renovations converted the previously vacant building into a sustainable office of the 21st century. This client needed a space that accommodates 80 employees in a flexible and mobile work environment. The client also needed to include a wide range of collaboration and conference spaces. These range from small study style collaboration spaces for 2 to 4 people, to larger conference rooms for 10 to 20 people, and even includes a large amphitheater style presentation area seating up to 160 people. It was imperative to this client to accommodate these elements in a noninvasive manner, preserving the industrial feel and open environment while still providing privacy where needed and comfort for employees and visitors. The preservation of industrial elements extended to the site where an overhead crane that was once used to unload heavy metals from train cars was preserved in place as a relic and character piece. A thorough analysis and understanding of the existing building’s history provided a strong starting point for the Architect’s vision. With the five-story multi-level platform scaffolding in place, deteriorated plaster was comprehensively repaired and restored to its original grandeur, and a painting scheme based on the most prevalent historically-accurate colors was developed to provide the “warm and engaging” interior environment desired by the congregation. Comprehensive renovations to the side entry areas below the bell towers included extensive plaster repair from water damage and new room finished throughout with upgraded and more appropriate furnishings. The removal of an aged lectern and arbitrarily placed Chancel furnishings support a more welcoming worship service setting. The result is truly transformational and has re-energized and united an important urban congregation charged with the “living stewardship” of a landmark structure. The restored space is now an inspiring ‘place” that seamlessly merges history and modern congregational needs. A dark and lifeless 5,000 square foot space was brought to life with an interior renovation inspired by the mission of Renewable Resource Group, a progressive energy resource company. The program included ten open offices, a large and small conference room, and a single sound-proof office. Using fabric sound panels and glass trimmed with salvaged 2×6 ceiling joists, the architects created colorful floating sound walls to separate the office alcoves while allowing light to diffuse around them. A fifty foot clerestory was built into the roof to flood the space with natural light. Additional slot windows were cut into the brick walls to provide natural ventilation and connect the third floor offices to views across the Los Angeles basin. A deconstructed model of the earth, constructed from one inch plywood discs, floats in the center of the space. The three sections of the twelve foot diameter globe provides functional areas for reception, work stations for traveling employees, and a modern “kiva” for informational meetings. Colors of red and orange greet visitors who enter the space from the East, while shades of blue meet users departing the west side of the office. The golden hues mimic Earth’s strata and echo the colors of the western sky. users walk in feeling warm and grounded and leave with washes of clean blues and open skies. Congratulations to Joshua Kiehl, AIA for receiving the AIA Central Pennsylvania’ 2014 Young Architect Award. Joshua has demonstrated leadership in his role as Manager of Architecture at Entech Engineering and has positioned himself as an example for the future of the profession. He is highly respected by his staff, his peers and the leadership of Entech. He works to find collaborative solutions on projects, he listens to understand a point of view before responding and he works for the benefit of all. In 2012, Joshua became a shareholder of Entech. At Entech, an offer to become a shareholder is reserved for those who are identified as future leaders of Entech, in which Josh again clearly has demonstrated his capabilities. No matter the project size or scope, Joshua’s approach to design is consistent. After carefully listening to the client and discussing their goals, Josh looks to find solutions that create buildings that will perform well and will offer the client a wise investment in their building assets. He focuses on designing for simplicity of spatial organization, massing and materials to create buildings that are easy to maintain, long lasting and aesthetically pleasing while fitting within a client’s budget. Josh extends his leadership and technical architectural capabilities to the breath of his community service work. Josh serves on his church’s building committee and has helped the church to better utilize and adapt several buildings that the church owns. Josh dedicated numerous hours in 2013 to participating on a Mission trip to Haiti where in conjunction with a relief effort with Weyerhaeuser, he designed a wood frame living unit which was intended to be prepared and shipped in a container to Haiti. Josh’s design for the living unit exemplified his design philosophy.